£35.00 Labour Plus Oils Parts and vat. £105.00 Labour Plus Oils Parts and vat. £140.00 Labour Plus Oils Parts and vat. 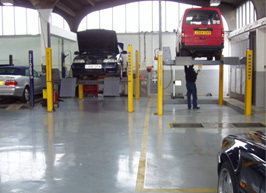 Keydrive Motor Services Ltd has a fully equipped service center located on the Kingston Road, leatherhead. We are able to cary out servicing and repairs to most makes of cars. Servicing, Clutches, Exhausts, Tyres.We have the very latest laser tracking and wheel aligment equipment.We can also carry out Air Conditioning Re - gassing and all sorts of general vehicle repairs. We are members of the Good Garage Scheme. Using the Good Garage Scheme, ensures you'll find local independent garages you can trust. You can be assured that every garage listed performs services to a strict standard and will always have your best interests at heart. Prices are based on average vehicle types. Some more expensive makes or sophisticated vehicles may be priced differently.